Dr. Bobby Corrigan, Urban Rodentologist, and Entomologist indicated recently at our fall training seminar that if a #2 pencil can fit into a hole or crack, so can a mouse. That’s because they have collapsible skeletons, right? Wrong, but that is a common misnomer. And it’s easy to believe when you consider how small a pencil is (about 1/4-inch). Got Mice? Modern Pest Services has the solution – GUARANTEED! Learn more about our HomeCare Green year-round protection program that covers 60 pests – including Mice! 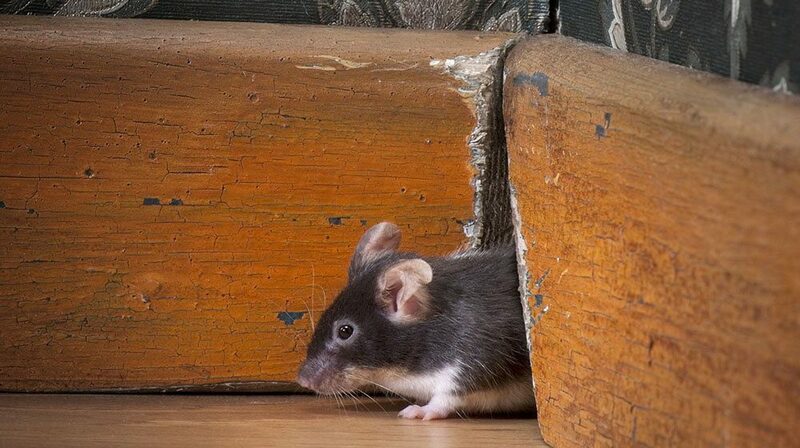 As burrowing animals, mice are designed to squeeze into and live in tight spaces. One large example of this is their small size. The fur on a mouse makes it appear larger than it really is, but if you were to shave off all of its fur, then you’d see exactly how tiny they are. Along with their size, mice have long, narrow bodies and are equipped with strong legs. To top it off, they don’t have collar bones. Just imagine all the holes you could squeeze through if you didn’t have collar bones. The only limitation a mouse has is its skull. All of this adds up to one fact: if a mouse can squeeze its head through a hole, the rest of its body can fit. To keep rodents out of your home, don’t underestimate the size of holes and cracks you see around the outside of your home or in your basement. Remember to look both high and low for possible access points, as rodents are excellent climbers having little trouble scaling verticle walls, or finding vegetation or wires that extend to your roofline. If you’re unsure what to look for, what to do or simply do not want to tackle your pest problem alone, partner with a pest management company like Modern Pest Services. Our licensed pest management professionals are trained to carefully inspect and target rodent “hot spots” around your home. Including the tiny crevices into which mice and rats can squeeze.